In our store, you can opt to pay by VISA, MASTERCARD, MAESTRO and AMERICAN EXPRESS cards. For security reasons, the details of the order are sent to the bank for confirmation and approval of transaction. Any delay in the execution of the order shall be due to the confirmation of the details by your bank. Choosing this delivery method you will not bear the shipping costs for purchases ABOVE EUR 30.00 and the order must be placed online. The corresponding sum shall be charged as a one-time cost, NOT in instalments. For purchases BELOW EUR 30.00, there is a cost of EUR 3.00 for shipment within Athens and a cost of EUR 5.00 for shipment outside of Athens. In the case of cash on delivery, there is an additional cost of EUR 2.00 respectively. This method of payment does not include shipment outside of Greece. For purchases made by credit or debit card at the store you will indicate, it is MANDATORY that the card holder appear at the store bringing along their ID Card or passport. With respect to the payment by credit card, the online store of the company APOSTOLOS KOUKAS & CO. OE cooperates with ALPHA BANK for your online payments by Visa and Mastercard credit cards. 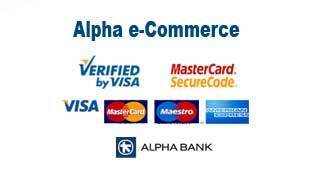 Your transactions with our online store are directly performed through the superior security systems of ALPHA BANK (ALPHA e-Pay Service), which guarantee a secure transaction environment. If you opt to make your purchase by credit card, you will be transferred to the secure transaction environment of ALPHA BANK (DeltaPay), where you will be prompted to introduce your credit card details. Upon successful completion of transaction, you will receive a confirmation email. For security reasons, our online store does not record the number of your credit card. The entire transaction takes place in the secure site of ALPHA BANK (Alpha e-Pay). You can receive your order in your location through courier services and the cash on delivery method. This method of payment incurs no charges for purchases above EUR 30.00, while for purchases below EUR 30.00 there is an additional cost of EUR 2.00. If you wish to pay your order by deposit into a bank account of our company, you must deposit the entire sum of your order together with the shipping and cash on delivery costs in the case of purchases below EUR 30.00. Please send us the copy of the deposit slip via email to info@cuca.gr and make sure to indicate the unique number of your order. If you use web banking, you may deposit the sum and send us the deposit slip via email to info@cuca.gr; please make sure to indicate the unique number of your order. Please be informed that the bank commission fee for wire transfer from another bank using the IBAN will exclusively be borne by customers. If you wish to deposit the sum of the order into a bank account and pick up the product(s) from the store, you must submit the deposit slip together with your ID Card or, if another person appears on your behalf, a power of attorney certified by a public authority indicating the details of the recipient. In such cases, you must place the order online or over the phone in advance. For store pick-ups, please be informed of the working hours over the phone or via email. For deliveries on Saturday via the courier service, there is an additional cost of EUR 3.00 for all options above. For shipment outside of Greece, NONE of the above charges apply. 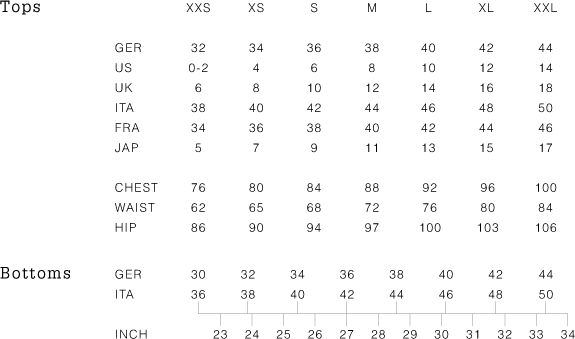 In this case, the cost is based on an international shipment price list. Shipments abroad are performed by post and charges vary based on the destination country. All prices include 23% VAT. In the search engines, some of our products are featured as “in stock”, namely they are available in our central warehouse or in our suppliers’ warehouses. Shipment is performed by the courier company ELTA Porta Porta. Delivery time: Athens: 1-2 business days Outside of Athens: 2-3 business days.